Dealing with joint pain can be a miserable experience. It’s a constant effort trying to keep the pain at bay on a day-to-day basis. You have to deal with the restrictions it places on your daily activities. The huge impact joint pain has on your life is often underestimated and the search for pain relief often difficult. Experts agree that there is no magic cure for joint pain. One reason is because a treatment that works for one person may not work for another. However, a growing body of research suggests that small interventions like moderate exercise, nutritional supplements, or even water aquatics may help reduce joint pain. When it comes to finding out what works for you, the journey to joint pain relief is usually one of trial and error. However, by using some of the tips below, that journey can become a little easier. Supplements are a popular and often effective way of alleviating joint pain. They can range from glucosamine or chondroitin to lesser known nutrients like bromelain or SAM-e. Most supplements attempt to cut down on stiffness, pain, and inflammation. Although most people know about supplements, few actually use them. There are hundreds of supplements on the market–some better than others. It is worth doing a bit of research to find out which one might work for you. Before choosing a supplement, keep in mind that they do not all work in the same way and are not all the same quality. Additionally, it’s best to stick to supplements backed by some degree of scientific evidence. Supplements that aren’t science-based typically use synthetic or low-quality nutrients and ingredients. Finally, if you are taking other medications, consult with your doctor to make sure they will not interfere. There’s an arthritis diet? Well, not exactly. But research shows that there are some foods that can help reduce joint pain and inflammation. Most of the foods that may be helpful are included in what is known as the Mediterranean diet—a diet that is rich in fresh fruits, vegetables, fish, and oil. The Mediterranean diet revolves around plant-based foods such as fruits and vegetables but also includes whole grains, legumes, fish, nuts, and olive oil. Trying the Mediterranean diet or trying to incorporate bits of it into your regular diet is a simple step that might make a huge difference in easing your joint pain. Omega-3 fatty acids are found in fish oils and have been shown to reduce inflammation in conditions like rheumatoid arthritis4. Fish is part of the Mediterranean diet but Omega-3 needs its own section because of its essential role in joint health. The importance of Omega-3 cannot be overstated. 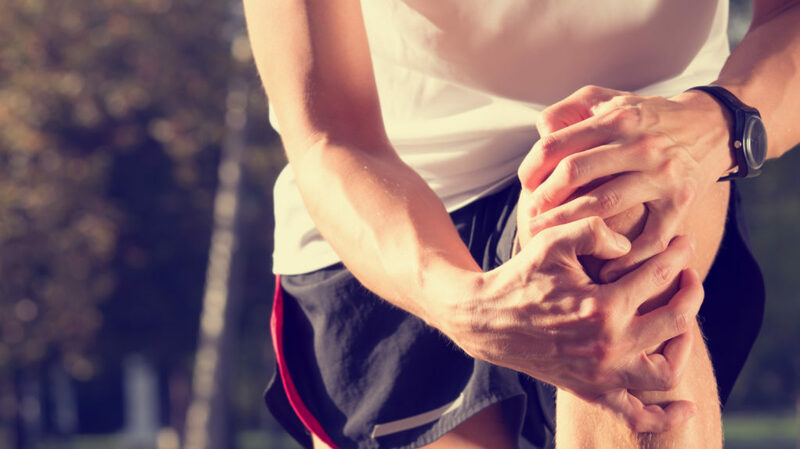 Studies have found that taking fish oil supplements helps reduce joint swelling and pain. Fish oil can also reduce morning stiffness and disease progression for those with rheumatoid arthritis2. If you don’t like fish, consider using Omega-3 supplements to get your daily intake. And even if you do eat fish, a supplement is still a recommended option to help with joint pain. While you may worry that exercising with joint pain will harm your joints or cause more pain, research actually shows the opposite. You can and should exercise (with certain caveats) if you have osteoarthritis or other joint conditions3. Exercise is considered the most effective non-drug treatment for reducing pain and improving movement in patients with osteoarthritis3. The caveats for exercising are as follows: it should only be light to moderate exercise (i.e. walking, swimming, etc.) and should first be cleared with your doctor or physical therapist. Everyone’s personal circumstances are different, so talk to your doctor before beginning a routine. Exercise in this context does not mean high-impact activities. Instead, it means giving the muscles and joints a chance to strengthen. Exercises like gentle stretching or those that improve flexibility and movement are beneficial. Performing these exercises often can help improve and maintain joint flexibility. Walking is the perfect example. It’s free (most of the time) and easy on the joints. Apart from helping joint function, it improves circulation and helps fight off cardiovascular disease. Aquatic exercises are particularly helpful for exercise beginners and those who are overweight. Aquatic exercises do not necessarily involve swimming. Instead, they are exercises performed while standing in about shoulder-height water. The philosophy behind aquatics is that water helps relieve the pressure of your weight on the affected joints (hips and knees in particular). You get the benefits of exercise without putting any additional stress on your joints. Regular aquatic exercise is thought to help relieve pain and improve daily function in people with hip and knee joint pain5. Understandably, aquatic exercise is not something that everyone can take up. Still, it is a good alternative to those looking for a new and different way to exercise. Different types of pain management work for different people. However, supporting your joint with exercises and nutrition specifically designed to ease your joint pain is the best way to go. In addition to the treatments prescribed by your doctor, the tips above can have a positive impact on your joint pain.